Once the domain of casual trainers and sport flyers, the .25 to .90 sized R/C airplane of today is far more likely to be a retract equipped Scale Warbird or a U-Can-Do 3D type aerobat than a Sig Kaydett or Senorita. As the number of flyers operating faster, stronger more aggressive and complicated aircraft increased, radio system manufacturers followed suit by making available stronger, faster and higher torque servos. On today’s .60 size aircraft, retract systems, glow drivers and/or high output-high speed servo's are commonplace instead of extraordinary. I find it amazing that folks still try to fly these planes with a ‘factory’ provided pack, when they’d never for a second use the ‘factory’ provided servos for anything much more demanding than operating the throttle in the same plane. Today's new radio systems take good advantage of computer technology and are designed to compliment and refine this new breed of R/C aircraft and style of flying. Yet, after nearly two decades of systems development, we're still seeing that same 600ma pack provided as OEM in the set and in the box. If you've got a high output servo system, handling a plane doing aerobatics Gramps and his Kaydett can't even name, it follows that you should consider upgrading to a pack a little more competent at delivering power in a high load environment than Gramps' battery pack. to pick the right pack for the way you Fly. Most folks react to the 'capacity' rating alone as being the biggest part of their decision in selecting a pack for their big aggressive birds. This can lead to big trouble on board the aircraft. Just as cells are evaluated for capacity, in high load applications you need to take into consideration what the cells voltage performance will be when loads are applied. All battery technologies react to servo loads with a voltage drop while the load is applied. It's really very simple.. the higher the cells impedance rating, the greater the voltage drop will be while servo loads are applied. Rule of Thumb for cell selection: Impedance Ratings are like a Golf Score. The lower, the better. 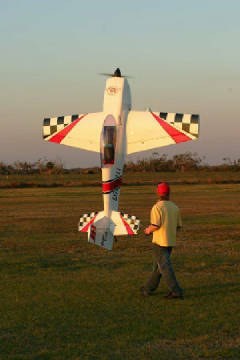 Aircraft in agressive aerobatic enviornments employing digital high torque servos should shoot for a combined impedance score of 10 mOhms or less. As an example, one of the most popular lightweight packs used in IMAC aircraft is the Sanyo HR 2700AUX.. plenty of capacity, but the impedance rate on the cell is 20 mOhms. Pretty high.. but if it's used in parallel with another 2700 pack the impedance rate is cut in half to 10 mOhms (and the available capacity is doubled). Which is why you usually always see this pack employed in parallel in IMAC birds and used without issues as a single pack in a big scale Cub. For more info and tips on Parallel Systems and a NiMH FAQ, check our Tech Tips page! For dedicated low impedance packs for 25% and larger applications, check our Giant Scale Packs page. Have a special requirement? Custom Packs are the heart and soul of our operation.. if you don't see what you need below or on our Giant Scale packs page, or would like some help picking out the best possible pack for your application, send us an email.. just clink on the 'contact' button on the nav bar to the left. Here's a reduex of the venerable Cadnica KR series 'A' dimensioned packs .. long the favorite of sport and giant scale fliers alike. Being an 'A' sized cell, it's the same height as the oem AA's and slightly larger in diameter than AA sized cells. This makes for packs that are significantly smaller and lighter than the bigger Sub-C Nicad packs yet, it has enough grunt to handle any ignition load and moderate digital servo loading. It can also be reliably fast charged at the field. In higher drain aggressive applications or just for redundancy in medium sized Warbirds we routinely use it in parallel for a capacity and load carrying boost on board without excessive weight gain. Available as 4.8v (4 cell) flat or square pack, or 6.0v (5 cell) flat or 3x2 square pack. Built with extra HD Quadruple Welded 1/4" wide straps & finished in HD Rubberized 3M MilSpec shrink. All prices include standard 22g system connector. There IS a difference!! Don't pay more.. GET more with a NoBS pack!